Bet Jets +3.5 over the Bills with Karamba. Bet Bills-Jets under 38.5 with 888Sport. Bet total Buffalo TDs under 2.5 at -190 with 888Sport. There isn’t much that can bring hope to a team that’s lost six straight games, but the Jets are trying to focus on the positives. The biggest, and maybe only one, is the return of Sam Darnold. The rookie QB has missed the past three games with a foot injury and was a full participant in practice this week. The Jets desperately need him back on the field, even against the lowly 4-8 Bills. The Jets have dropped six straight but have been a cover machine over this skid. With the return of Darnold on Sunday, the Jets should be poised to defeat the Bills outright. 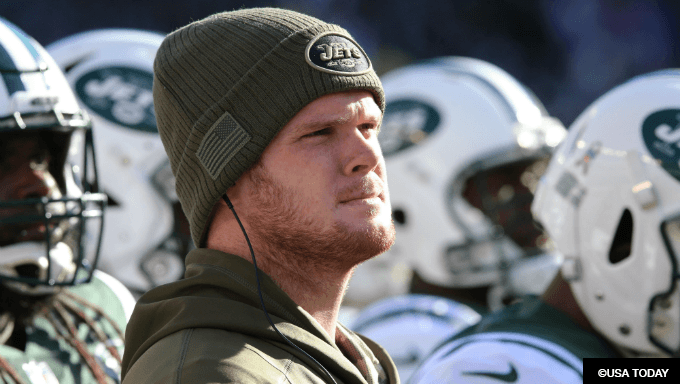 For the first time in a month the Jets are expecting Darnold out on the field. Backup Josh McCown was limited, so barring any setbacks this is Darnold’s day. Isiah Crowell (toe) is out this week but WR Quincy Enunwa (ankle) was limited in practice but is expected to start. Darnold’s ability to make some throws should help alleviate the injury to Crowell in the run game. They have been successful in utilizing both Enunwa and Robby Anderson against Buffalo’s beaten-up secondary. The Bills won’t have one of their top DB playing against Darnold as cornerback Taron Johnson underwent shoulder surgery and is out indefinitely. For Buffalo, Josh Allen has shown no signs of regressing following his return two weeks ago. He complied 231 passing yards and 135 rushing yards last week against the Dolphins. Despite a 21-17 loss, Allen was all over the field, nearly leading a game winning comeback. Safe analysis is Allen can’t continue to do it by himself, but after last week’s meltdown by the Jets in Tennessee anything is attainable against the Jets defense. Still, the smart bet is the Jets +3.5 with Karamba. While they blew a big lead last week to the Titans – losing 26-22 – it was the first time the Jets went over 20 points in their losing streak. The Bills should be able to keep it close with Allen but just can’t score enough points. They average just over 14 a game, and even the Jets are a near full TD ahead of them in scoring this season. Another divisional battle between these two teams should lend to a close and low scoring game. The biggest advantage the Jets have is not having to rely on Darnold as the Bills will on Allen. Neither of these teams can score which should factor in to these two teams coming in on the under for Sunday. While the Jets are struggling to stay above 20 a game, it’s the Bills who can’t seem to put anything consistent down. Some of this average for the Bills is based off a three-game stint where they failed to hit double digits. However, Buffalo had another slow start last week putting up just six points. Their defense hasn’t been horrible when it comes to allowing points and neither have the Jets. Bet the under with 888Sport. This could be a battle of FGs when it comes down to it. While Darnold and Allen have made a couple of throws this year, it’s been mostly avoiding turnovers. It’s going to be difficult for either team to put up three TDs on Sunday based on how inconsistent the offenses have been. This offense has been so bad this season it has only gone over two TDs two times all year. If the Jets can force one turnover it should be enough to grind this Bills O to a halt. I like Allen and Buffalo to settle for FGs over TDs. Bet the under at -190 with 888Sport.